My childhood summers consisted of many trips up to Maine beaches, which always also included Maine lobster. YUM! So to me, nothing says summer more than some red hot lobster. 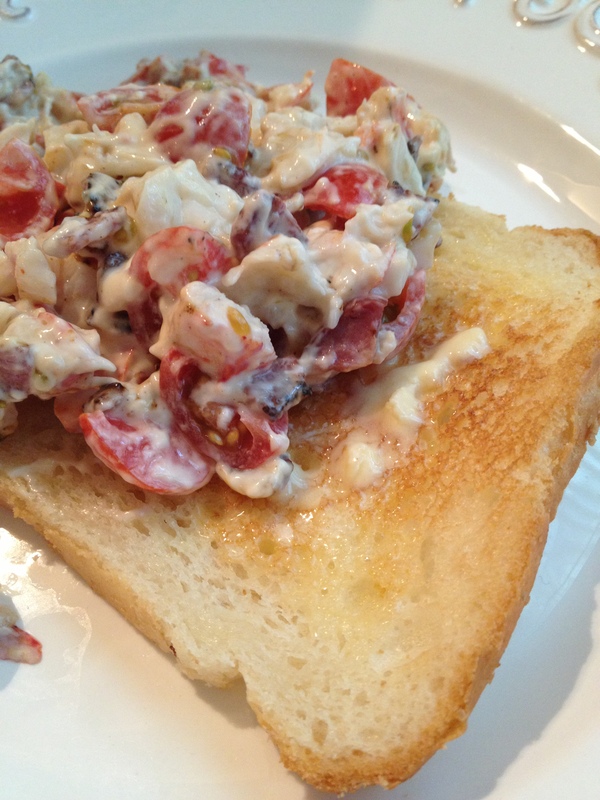 After a very filling recent lobster dinner, I took some leftovers and made a Fancy BLT open sandwich the next day. Even better the second day! Strip the claw and tail of the lobster to get all possible meat. Shred with your fingers or a fork and put into a bowl. Cut the bacon into small bite sized pieces and saute on medium heat for about 5-7 minutes, until crispy. Slice the cherry tomatoes into quarters. Chop the celery into the same size pieces as the tomatoes. Add the sauted bacon, cherry tomatoes, celery, lemon pepper, and mayo to the lobster meat and stir to combine. Toast and butter the bread to your liking. Create an open sandwich by scooping lobster salad on the toast.